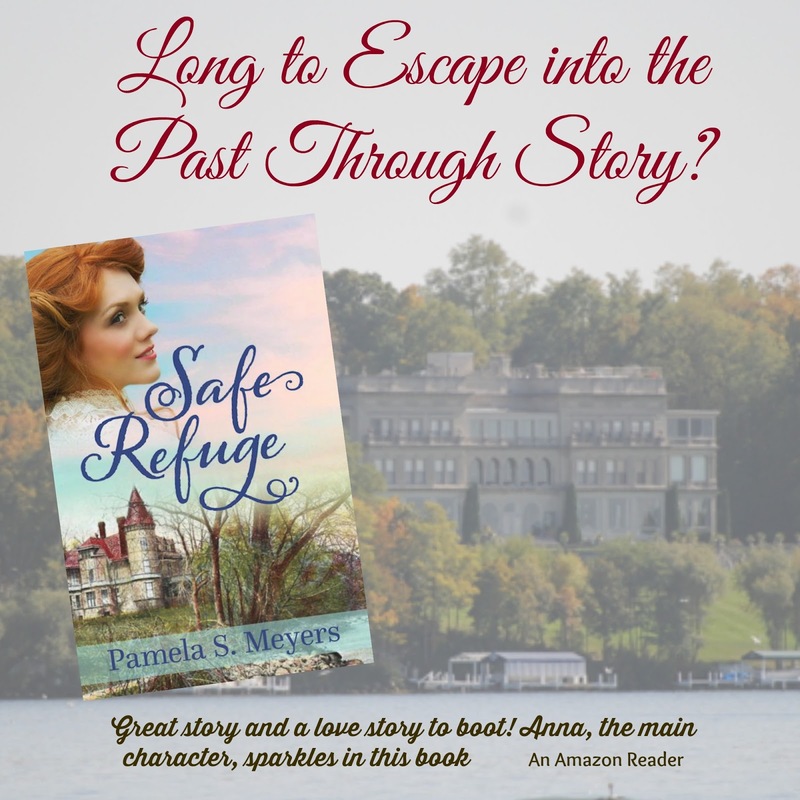 During the last couple of years, I’ve been featuring stories of the fancy estates and their owners that have populated the lakeshore of Geneva Lake in southern Wisconsin. I still have a few more estates to highlight, but this month I want to focus on one of the first structures to sit close to the shoreline in the town of Lake Geneva. It wasn’t fancy or large and, in appearance looked more like a farm house than a mansion. 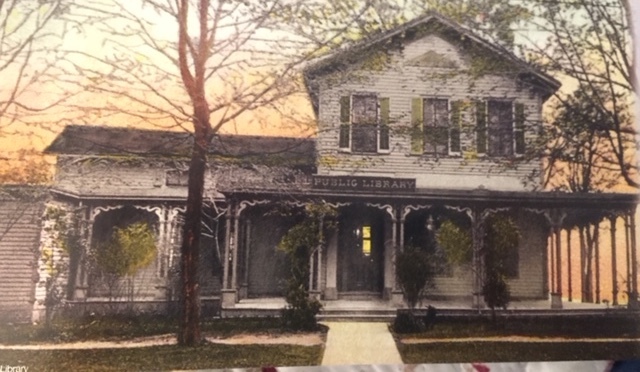 The Sturges cottage that became a library. flames and they immediately arranged to return to the Farr cottage, which George purchased. They stayed there until George built them a new home on the lakeshore some years later. You can read more about Snug Harbor and the beautiful home George built by going to my post on this blog. 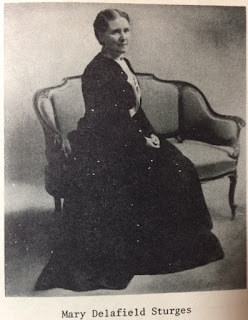 George passed away in 1890, and in 1894, Mary offered to the city of Lake Geneva, as a gift, her cottage and the lots directly to the house's west with the stipulation that the house would be used for a public library and the rest of the property be turned into a park. This involved closing a public street that ran east and west behind her house along the lakeshore. 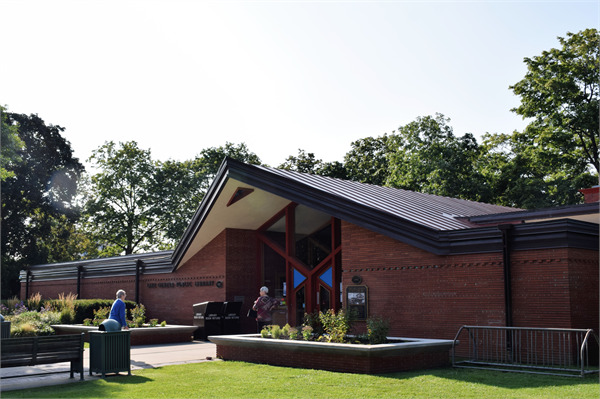 Several collections belonging to public reading rooms in town were combined, and the new Lake Geneva Public Library opened in August 1896. 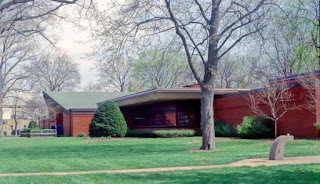 The small home was Lake Geneva's one and only public library until the mid-1950s when, because of the building's aging structure and the growing size of the library's collection, discussions began about replacing the library building with a new larger one that looked like most every other library. At a later date those plans were scrapped and after soliciting for a new design, the library board chose a design that was submitted by James Dressler, a student of Frank Lloyd Wright. 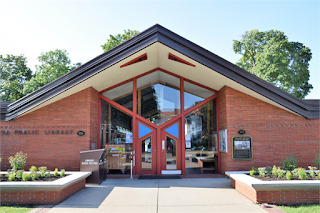 The new building's design was very much in keeping with the prairie style associated with the famous architect. 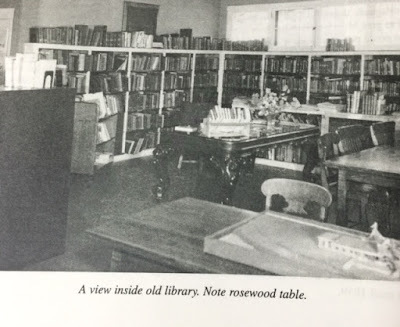 In 1953, the collections were packed up; some books vital to students in their studies, as well as novels and nonfiction books, were made available at a community building. The rest were stored at various places round town--some in a church, others at the grade school, and the rest in the basement of a drug store. View from the library's window wall. a stark contrast to that of most libraries at that time. Since then, an addition was made at the west end of the building, so seamless that you wouldn’t realize it wasn’t part of the original building. 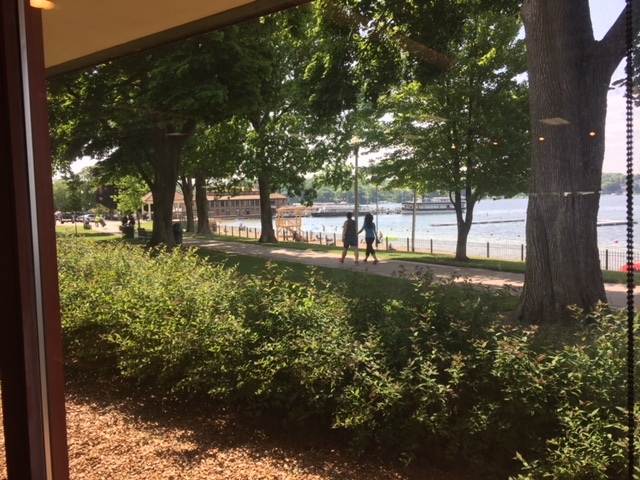 Also added at the same time, was a bump-out of a window wall that allows people to relax and read or just look at the ever-changing view of the lake. I often spend time there doing research for my historical Lake Geneva novels and usually become so captivated by the view I forget I’m there to work. You can learn more about this beautiful and unique library by going to their website. 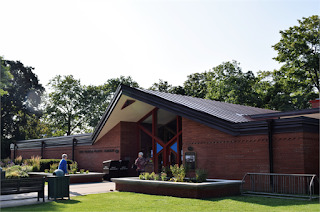 There you can click on the link to the picture gallery that contains many photos of the interior and exterior along with some of Library Park. 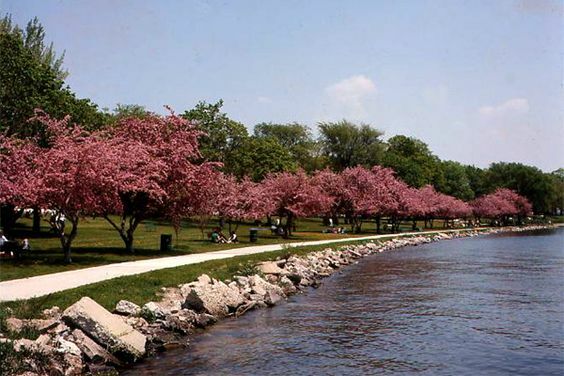 Mary's intent for the park was to give those not able to afford lakeshore property a way to enjoy the lake's beauty. Those of us who are aware of this special gift are very grateful to her. No matter the season, there is always a wonderful view, begging you to find a park bench and rest a spell and maybe read a good book you just found at the library. 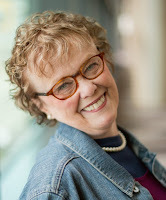 All thanks to Mary D. Sturges. I like to think if she could came back to see for herself the library and the beautiful park she envisioned for that property she would be very pleased. I know I am. Photo of interior of original library: History of the Lake Geneva Library, Ginny Hall, 1999, p. 11. Photo of Mary Sturges: Lake Geneva Newport of the West, Betsy Gage & Ann Wolfmeyer; 1976; Lake Geneva Historical Society, Inc.
Lake Geneva Newport of the West, Betsy Gage & Ann Wolfmeyer; 1976; Lake Geneva Historical Society, Inc.
Pam has written most of her life, beginning with her first diary at age eight. 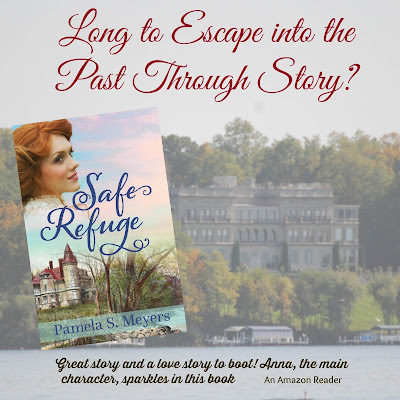 Her newest release, Safe Refuge, is the first of three novels in her Newport of the West series. She resides in northern Illinois with her two rescue cats and is only an hour or so away from her home town of Lake Geneva, Wisconsin where she can often be found researching and nosing for new story ideas. Wow! How beautiful! Thanks for sharing this wonderful place with us. for which Mary Sturges intended. The pictures added so much to this post. A lovely view to sit and read. Oh, I loved this post. I actually remember visiting the library in the Sturges home in the 1950's on a GirlScout/Brownie field trip. So interesting, and Lake Geneva was always a day-touring destination from Racine, Wisconsin, where I grew up. Fun post! I thoroughly enjoyed this post, Pamela. So many modern buildings are lacking character and special details that make them unique to their setting that it's heartening to hear of one that's built to flow with the setting instead of being in stark contrast to it. Great pics, too.